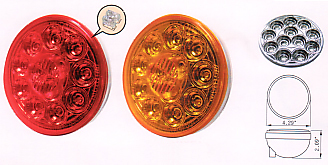 12 Square LED's in a sealed round light base for the stop/turn/run lights on the rear of trailers. This is the standard SAE size for commercial semi-trailer (over-the-road) big rig stuff. Simple replacement of stock units. 3 bullet connectors molded in the back to plug wiring into. Brightest and widest dispersion angle available. 12 Square LED's in a sealed round light base for the stop/turn/run lights on the rear of trailers. This is the standard SAE size for commercial semi-trailer (over-the-road) big rig stuff. Simple replacement of stock units. 3 bullet connectors molded in the back to plug wiring into. Brightest and widest dispersion angle available. These are aux. or back-up clear lens lights to give a white light. Only function on the brake circuit, or one of the two standard plug connectors light the unit up.